'Feed Your People': Big-name chefs share their big-batch recipes – J. Produced in collaboration with 18 Reasons, the San Francisco cooking school and community hub, the cookbook features photos by Molly DeCoudreaux and more than 60 recipes from a variety of chefs — many in the Bay Area — who talk about what they love to feed their own people, especially when it’s a crowd of them. A workshop based on the book will be offered Oct. 13 at the San Francisco Cooking School. “How to Feed Your People Like a Jewish Grandma” takes place from 4 to 8 p.m., with big-batch recipes on the menu for matzo ball soup, latkes, brisket, and orange and almond cake. 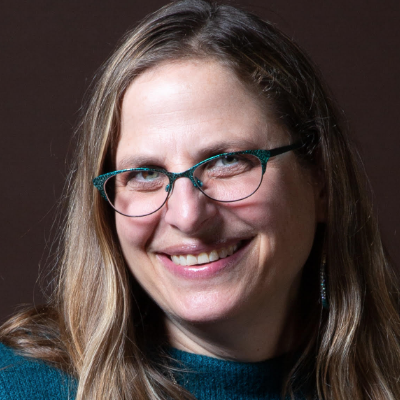 Jonath, who grew up in Palo Alto, said the idea for the book came out of her mother’s practice of making hundreds of latkes for her daughter’s annual “latke and vodka” party. “My mom always made latkes at Hanukkah, and my dad had this good friend who was Russian, and he started us on this ritual, where you have a shot of vodka and then eat a pickle,” she said. The party started out small, but when it grew, her mom, Suzanne, quickly realized that standing over the stove frying latkes during a party isn’t so much fun and she’d rather be socializing. So she started cooking them in advance and freezing them in giant plastic bags, to be reheated in the oven during the party. She is the only nonprofessional chef to have a recipe in the book. Her latkes include a tablet of vitamin C, which she says keeps the browning of the grated potatoes to a minimum. Jonath took over the party at some point, but her mom still contributed the latkes. When Jonath met and befriended Anya Fernald, the founder of Belcampo Meat Co., they joined forces on the food: Fernald would make a brisket, and Jonath’s mom would bring a cooler filled with 200 latkes. While the parties are exclusively Jonath’s now, her parents are always part of the mix. Jonath, who was a cookbook editor at Chronicle Books for many years, is aware of how food has the power to bring people together, but when she looked around for books specifically about cooking for large groups, she had trouble finding any. It was an ambitious project and took her years to complete. Not only did she need to secure a publisher’s backing, but she had to raise money through a crowdsourcing campaign, too, joining forces with 18 Reasons. When it came to choosing contributors, she drew upon her background as a cookbook editor. “I had worked with a lot of really interesting people whom I admired so much,” she said. She approached those she knew — like local cookbook author Joyce Goldstein, who contributed a lasagna recipe — as well as others she didn’t know personally. Perhaps one of the most notable celebrity chefs in the world right now, Yotam Ottolenghi, has an eggplant recipe in the book. 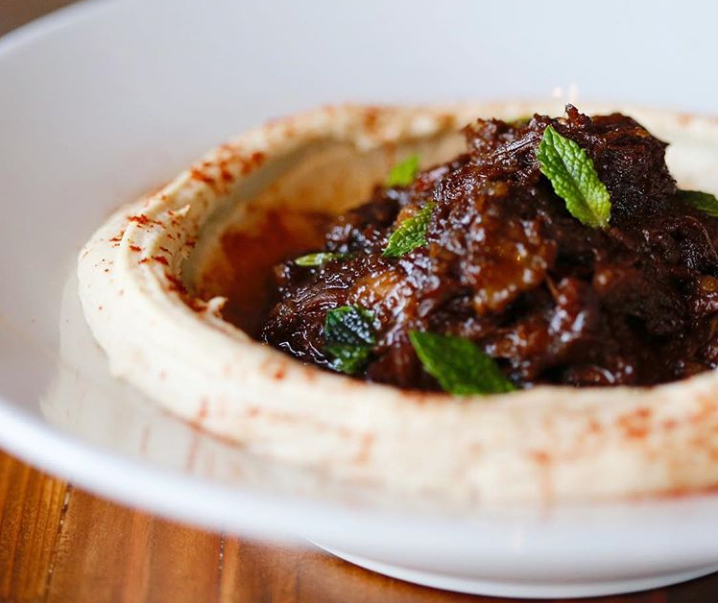 Other Jewish chefs who participated include the Brooklyn owners of the Mile End Deli Rae Cohen and Noah Bernamoff, Berkeley-based chocolate queen Alice Medrich, London-based Jewish cookbook author Claudia Roden, and local cookbook author and blogger Gabi Moskowitz (her recipe is below). Jonath asked all of the chefs for a recipe they like to make for a crowd, especially family or friends. “I was interested in people who had rituals” around food, she said, which is why there are recipes for seafood boils and paella, stews and chilis. Nearly every Friday, Gabi Moskowitz, author of “The Brokeass Gourmet” and “Hot Mess Kitchen” and producer of the television show “Young and Hungry,” hosts a Shabbat dinner for family and friends. It’s the perfect end to a hectic week. Follow her lead and turn off your cellphone, roast a chicken or cook a brisket, and fill your home with warm, savory smells. Then all you need is some wine and as many people as you can crowd around your table (or, if you’re like Gabi, into your tiny apartment living room). Gabi’s classic challah dough, rich in eggs and oil and lightly sweetened with sugar, is used here to make her signature weekend cinnamon rolls. The dough can be made and the rolls baked the same day, but she advises a long, slow rise in the refrigerator, which is good for both the dough (allowing the various ingredients to mingle leisurely) and the baker (who doesn’t have to get up early to make the dough). but you can use a stand mixer—the paddle attachment for mixing the dough, and the dough hook on medium speed for kneading—for both steps, if you prefer; a 9-by-13-inch baking dish. for breakfast, make the dough the day before, through the first rise. Roll out and fill the dough, shape and cut the rolls, and transfer the rolls to the prepared baking dish. Cover tightly with plastic wrap and refrigerate overnight or up to 18 hours. The next day, remove the rolls from the refrigerator and let rise for 1 hour or so (until the rolls look puffy) before baking, then bake as directed. Preheat the oven to 350 degrees and then turn it off. When it is time for the dough to rise, the oven will be warm but not hot. Make the dough: In a large, heat-resistant bowl, whisk together the warm water, 1/4 teaspoon sugar and the yeast and let sit for 3 to 4 minutes to activate (it will become foamy). Whisk in the remaining 1/4 cup sugar, the oil, eggs and salt, continuing to whisk until all of the ingredients are fully incorporated. Switch to a wooden spoon and slowly stir in enough of the flour until the dough is too stiff to stir. Lightly flour a work surface and turn the dough out onto it. Knead the dough, adding more our as necessary, until smooth, elastic and slightly sticky, 8 to 10 minutes. Shape the dough into a ball. Rinse the bowl you used for mixing the dough, dry well, and then coat with oil. Place the dough in the bowl and turn to coat it evenly with oil. Cover the bowl with a kitchen towel and place in the warm (not hot) oven. Let rise until roughly doubled in size, about 1 hour. Make the filling: In a bowl, combine the butter, granulated sugar, and cinnamon and, using a rubber spatula, work together to make a smooth paste. Shape and bake the rolls: Butter a 9-by-13-inch baking dish. Transfer the dough to a very lightly floured work surface and knead briefly to release excess air bubbles. On the lightly floured work surface, roll out the dough into a 13-by-10-inch rectangle, with a long side facing you. Use the rubber spatula to spread the filling evenly over the dough. Starting with the long edge farthest from you, roll the dough tightly toward you into a tight cylinder. Pinch the seam closed to seal the cylinder. Using a sharp knife, cut crosswise into 12 slices each about 1 inch thick. Arrange the slices, with a cut side up, in the prepared dish. Cover tightly with plastic wrap and let the dough rise in a warm spot until the rolls look puffy, about 1 hour. Preheat the oven to 350°F. Uncover the baking dish and bake the rolls until nicely browned, 14 to 16 minutes. Let cool in the baking dish on a wire rack for 15 to 30 minutes. Make the icing: In a bowl with a handheld mixer, or in a stand mixer filled with the paddle attachment, beat together the cream cheese, butter, confectioners’ sugar and vanilla on low speed until combined, then increase the speed to high and beat until smooth, thick, and spoonable. If the icing seems too thick, beat in milk to thin as needed. 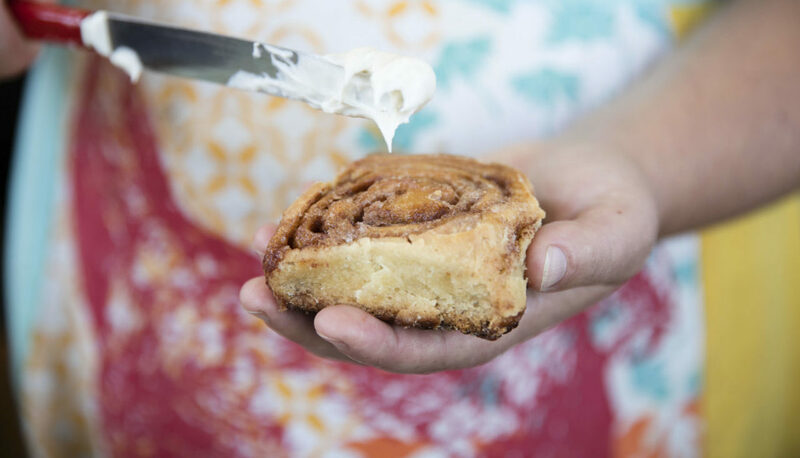 Spread the icing over the warm rolls and serve.